From the Republican Jewish Coalition newsletter: "Long wait times, deaths caused by delays in tests and treatments, false record-keeping, and national outrage. That is the story of the Veterans Administration's failure to provide appropriate care for our nation's veterans." 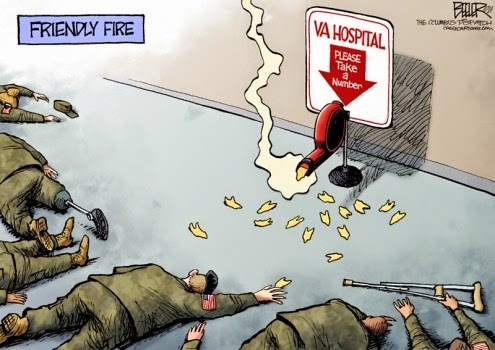 After the first revelations about veterans' deaths and hidden waiting lists in Phoenix, information has come out about secret waiting lists, purged records, and more deaths in many places, including New Mexico, Colorado, Texas, California, Florida, North Carolina, and West Virginia. At this time, 26 VA facilities are under investigation by the Office of Inspector General at the Veterans Affairs Department. This is one [and so far only one] scandal that has hit the nerve of both Republicans and Democrats. Rep John Barrow, D-GA, said "this administration has fallen short in providing the kind of care that our veterans have earned," The Washington Post reports. "Rep. David Scott, D-Ga., said he was "very disappointed" with Obama's remarks. 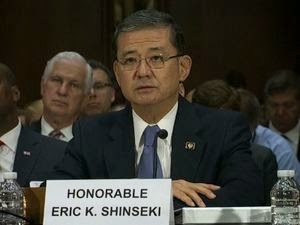 "There was no urgency," said Scott, one of two Democrats who have called for Shinseki to resign. "Mr. President, we need urgency." There is no doubt that the Veterans Administration health care administered to veteran's is complete government control [in essence a single payer system-where the single payer is the federal government]. From the Veterans Administration web site: The "VA operates the nation's largest integrated health care system, with more than 1,700 hospitals, clinics, community living centers, domiciliaries, readjustment counseling centers, and other facilities." From the NRO's Josh Encinas we find the ultra-liberal NY Times columnist Paul Krugman in 2011 praised the VA saying it could be a model [for a single payer system]: "New York Times columnist and Princeton economist Paul Krugman wrote an article praising the Veterans Health Administration, calling the VA a “huge policy success story, which offers important lessons for future health reform.” “Yes, this is ’socialized medicine,’” Krugman said of the VA system." Some have said, and I agree, that Obamacare is not the ultimate goal of the liberal Democrats, it is just a stepping stone to what they really want. In fact, many of them have been secretly hoping that Obamacare fails so they can then go to the American people to say that the only solution is a government controlled single payer system where everyone receives health care. With this scandal ongoing I have tweeted, along with many others, that this portends what all Americans will look forward to [in horror] with Obamacare: long waiting lines and rationed care, that could mean death for some who do not receive treatment in an appropriate time period. With the millions added to an already burdened system, that certainly looks likely to happen. But on reflection, Obamacare is not the most appropriate analogy to health care administered by the Veterans Administration. Under Obamacare there are still private hospitals and private doctors and private health insurance companies [although the rules now are established by the federal government]. No, the more appropriate analogy to the Veterans Administration's health care system is a single payer system - a government run health care system. To use the words of Paul Krugman, "socialized medicine." This horrible scandal out of the Veterans Administration threatens the Democrats [liberals] dream of such a government controlled health care system for all of America. President Obama [and other Democrats] blame the problems of the Veterans Administration increasing slow health care to veterans, to the increase number of veterans coming home from the Iraq and Afghanistan wars [i.e., "it's Bush's fault"]. But if that's true, think of a Veterans Administration type operation for every American, where your not talking about thousands more people to take care of, but hundreds of millions more people. While the American people are rightly outraged at the treatment [or lack thereof] of our veterans at the hands of the government controlled Veterans Administration, the thought of long waiting lines, rationed care, delays in tests, and false record keeping happening to every American would be a political nightmare for any politician calling for such a government controlled system for the whole country. Social security is called the third rail of politics [like the electoral rail of a train track that carries high voltage power] because any politician who dares touches it [i.e., attempts to reform or make changes in it] surely dies politically. It is my contention that because of the Veterans Administration scandal, we can now add the private health care system, along with social security, as the third rail of politics. Any politician who now attempts to reform the American health care system into a single payer government run system, will surely die politically. While the VA scandal may not be the catalyst to end Obamacare [hopefully its demise will fall by its own unpopular weight], the VA scandal should end, once and for all, the liberals dream of a government controlled single payer health care system; and that will be a good thing for America.